Local anesthesia is used when the dentist needs to numb a certain section or small area of your mouth. It is usually injected into the gum or inner cheek. In the past, Novocain was the go-to local anesthetic drug; however, it has largely fallen out of use. Longer-lasting and better-working drugs, such as Lidocaine, have replaced Novocain. The newer drugs are considered safer and generally result in fewer allergic reactions. When the drug is injected there are a few other ingredients included in the shot. A vasoconstrictor which narrows the blood vessels and helps the numbing agent last longer. Additionally, there is a chemical to keep the vasoconstrictor from breaking down. The other two ingredients are sodium hydroxide and sodium chloride, which aid in the numbing effect. There are two types of injections: an infiltration injection and a block injection. Infiltration injections numb small areas while block injections numb larger areas such as one whole side of your jaw. 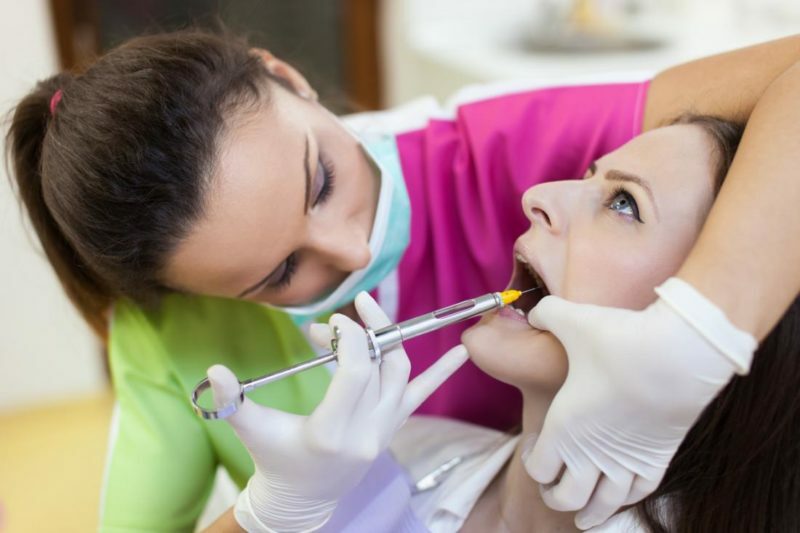 When your dentist performs a procedure that requires local anesthesia, they will dry the part of your mouth that will receive the shot with cotton or air. Some dentist may then rub the area with a small about of numbing gel to make the injection less painful. Once the skin is numb, your dentist will slowly inject the local anesthetic. You may experience a stinging sensation as the anesthetic seeps into the tissue. Local anesthesia can last for several hours. Once the procedure is finished, it’s important to be careful not to bite down on the numb area. You should refrain from eating and drinking until the anesthesia fully wears off. If you operate a wheelchair with “sip and puff” technology, you may not be able to operate it effectively for several hours after your dental procedure. It’s advised that you bring someone with you who can use the manual controls until the numbness goes away. Side effects from local anesthesia are fairly uncommon. One early side effect is a fast beating heart. Sometimes the vasoconstrictor drug can cause your heart to beat faster for a few minutes. Occasionally, the anesthetic may affect other parts of your face. In this case, your mouth or eyelid may droop and it could feel uncomfortable. Fortunately, these effects resolve themselves as the drug wears off. Sometimes a drooping eyelid may need to be taped shut until you can blinking regularly again. Another side effect is what’s called a hematoma. This is a blood-filled pocket that forms if the injection needle damages a blood vessel. Your dentist should spot this and be able to determine if it is of serious concern or not. One of the more serious side effects is if the needle hits and damages a nerve. If this happens, the area or some other part of your face may be numb or in pain for several weeks or even months. In most cases, the nerve does heal eventually. It’s important to inform your dentist of any and all drugs you are taking. This includes over-the-counter-drugs, supplements, and homeopathic remedies. If you know that you have allergic reactions to some medications, be sure to tell your dentist.